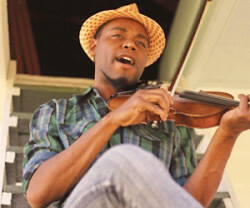 Spearheading the emerging generation of Cajun and Creole musicians, Cedric Watson is a fiddler, vocalist, accordionist and songwriter of enormous talent and potential. Injecting a healthy dose of his own personality and ingenuity, Cedric has been exciting an ever-broadening audience with his unique take on traditional Creole music, and with his new compositions that expand the genre while still respecting its roots. In the few years since he assumed the role of bandleader, all three of his albums have been nominated for Grammys. Moving with ease between fiddle and accordion, and adding his strong blues-inflected vocals, Watson’s creative style and obvious joy in playing make him an engaging and exciting performer.